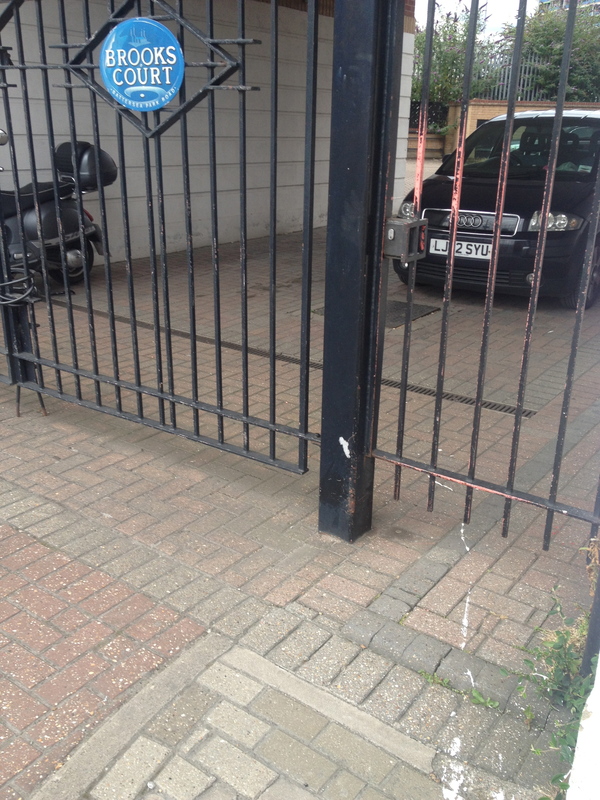 The Barclays Bridge? Or The Coca Cola Crossing? Wandsworth Council has approved plans for a new £40m bridge across the River Thames in London and is to hold a design competition to take it forward. The new pedestrian and cycle crossing would connect the rapidly developing Nine Elms district on the south side with the Pimlico embankment to the north. Its exact location is yet to be confirmed but the preferred options are close to the site of the new US Embassy. The plan for the design competition comes after a Transport for London feasibility study confirmed the bridge would cost around £40m and is forecast to carry approximately 9,000 pedestrians and 9,000 cyclists a day – proving a car free alternative to Vauxhall or Chelsea Bridge. The competition could be launched before the end of the year. The bridge is part of a £2bn infrastructure package transforming Nine Elms into a new Zone One transport hub complete with two new Northern Line tube stops. Wandsworth Council leader Ravi Govindia, co-chair of the Nine Elms Vauxhall Partnership, said: “This will be a new bridge at the centre of the world’s greatest city so the design standard has to be exceptional. It will be a dream commission for the winning architect but to succeed they will have to meet some very unique challenges and expectations. “The design will have to inspire and win the hearts of Londoners who are tremendously proud of their river and its heritage. It must work alongside the cutting edge modern architecture of Nine Elms as well as the elegant buildings on the north bank. There will be engineering feats to overcome and the landing points on both sides must integrate sensitively and effectively with their surroundings. The bridge and other transport improvements will be funded from private Nine Elms developments and from growth in local business rates income. Once a design is in place Wandsworth Council will explore further funding options that could see the bridge built sooner. This could include sponsorship. Another development planned. I know, when you’ve seen one…………. Christies warehouse this time (I’m a bit late with this one, sorry). More blather about ‘affordable’ homes (i.e. 80% of the local market rate). With rents rising by 20% a year that effectively means tenants will be charged the ‘non-affordable’ rent in situ last year. Wandsworth Council has approved plans to replace the Christies Fine Arts Warehouse in Nine Elms with a mixed use development including 510 homes and new cultural space. The site is located in the heart of Nine Elms on the South Bank, London’s biggest regeneration project, which includes the new US Embassy, Battersea Power Station and New Covent Garden Market. Plans to redevelop the 2.7 acre site were approved last night (June 17) by the council’s planning applications committee. The proposal, by developer Bellway Homes, would see the warehouse demolished and replaced with two new buildings which at the highest point would be 19 storeys. The new blocks would be predominantly brick but with each having a different architectural treatment. They would provide a total of 510 homes including 76 affordable properties and 114 set aside as private rent units which would be offered to local people on extended tenancies of up to five years. As part of the planning application the homebuilder has agreed to pay an additional £10m to Wandsworth Council for providing ‘off-site’ affordable housing in the local area. The scheme would also create 1,352 square metres of new commercial floorspace and 1,122 square metres of community use floorspace – some of which will be offered to not-for-profit cultural organisations at 50 per cent of market rates. A new outdoor public space would be created on the site, including part of the new Nine Elms Linear Park which will run all the way from Vauxhall Cross to Battersea Power Station. The application also comes with a £9m contribution to extending the Northern Line into Nine Elms and other improvements to the area’s infrastructure. “This is great news for Nine Elms. We are seeing more and more warehousing and industrial land making way for new homes, jobs and cultural attractions that will bring the area to life. “This development provides another portion of the new linear park which will run right through Nine Elms as well as £9m for improving local infrastructure. There will be hundreds of new homes built including affordable rent and shared ownership properties. Nine Elms on the South Bank is one of Europe’s biggest regeneration programmes. More than 18,000 new homes will be built and enough business space to support up to 25,000 jobs. A further 22,000 construction jobs will be created during the area-wide building programme. Wandsworth Council if helping unemployed local residents secure these valuable opportunities via a dedicated recruitment service. The Northern Line Extension will provide the major transport artery which makes the new Nine Elms possible. An infrastructure project championed by Wandsworth Council, it has now won financial support from the Government and is working its way through the planning system. A brand new public fresh produce market and centre for London’s foodies will be created at New Covent Garden Market. An entire town centre is being formed within and around a rejuvenated Battersea Power Station. Every new development will add to the area’s life and vitality with new cafes, bars, restaurants, cinemas, pubs, shops, boutiques, an auditorium, galleries, event venues and cultural attractions. A new stretch of the Thames riverside walk will run the full length of the regeneration area, extending the cultural offer of the world famous South Bank through Vauxhall and all the way to Battersea Park. An ambitious cycle strategy seeks to create a network of up to 23 interconnected routes including separate bike lanes on main roads like Nine Elms Lane and Battersea Park Road. A new pedestrian and cycle bridge is proposed to cross the Thames from near the site of the new US Embassy and to link with the established communities of Pimlico on the north bank of the river. Major developments now on site include Riverlight, Embassy Gardens, Battersea Power Station and the new US Embassy. The first proposed changes to a south London road junction have been unveiled by Transport for London (TfL) in an attempt to make it safer for cyclists. 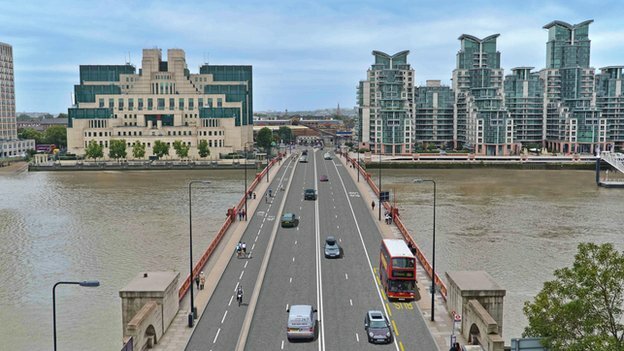 TfL plans a largely segregated cycle track to run from Oval across Vauxhall bridge to Pimlico on the north bank of the Thames. The plans are the first stage in a larger overhaul planned for the Vauxhall gyratory system. 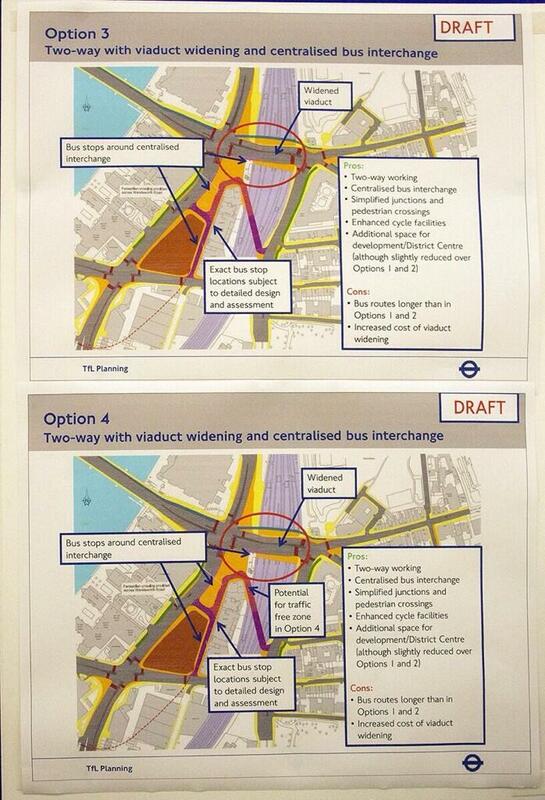 Westminster Council has presented three options for a revised route. The consultation about the dreadful Vauxhall gyratory and cycle superhighway 5 could be just the start of long-awaited changes on London’s streets. As this is the first junction to be redone under the mayor’s cycling revolution it will come under intense scrutiny, both from cycling campaigners and motorists who fear it will make congestion worse. And remember, this should be just the first; other junctions will use similar segregated designs. Campaigners remain frustrated it’s all taking so long, and policy makers in cities across the world who are also trying to increase cycling, will be watching developments here closely. The junction at Vauxhall was branded“genuinely dangerous” and “the one I hate the most” by the London mayor’s cycling commissioner in June after a fatal cycling accident there. Andrew Gilligan, the London mayor’s cycling commissioner, told BBC London 94.9 that the junction at Vauxhall is “unavoidable for thousands and thousands of cyclists”. About 3,000 use Vauxhall Bridge in the rush hour, comprising nearly a quarter of traffic during that period. Under the plans, a continuous two-way cycle track will be built from Kennington Oval to Pimlico, through the gyratory system and across Vauxhall Bridge. A public consultation which is now under way, will last until 14 September. Odd, I don’t suddenly feel rich. Lifted from Monday’s City AM free news sheet. Property in Kensington and Chelsea now costs more than £10,000 per square metre, the Halifax said today, making it the most expensive borough in the UK. 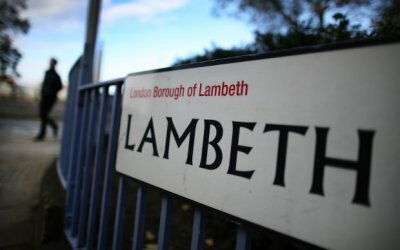 Prices in the district have shot up 56 per cent in the last five years – just behind Lambeth, where the cost has risen by 61 per cent. The average property in the south London borough now costs £432,100, equivalent to £5,108 per square metre. In third place is Lewisham where properties cost an average of £314,859, or £3,747 per square metre – up 53 per cent compared with 2009. Measured by cost per square metre the most expensive 20 boroughs are all in London. Across the capital as a whole, a square metre of property costs £3,952, up 32 per cent over five years. Next most expensive is the south east at £2,434, up 13 per cent on the same period. 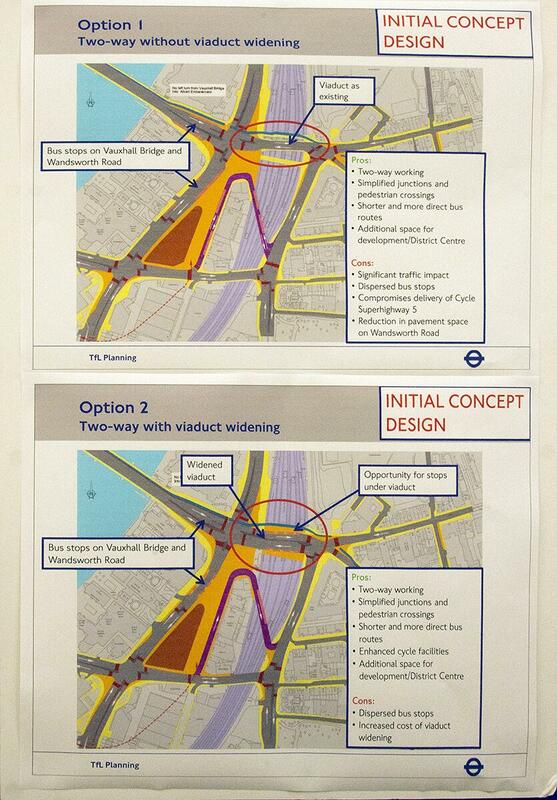 Tfl would appear to be offering four options in respect of the Vauxhall Cross road/gyratory redevelopment. None of them retains the Bus Station. So much for ‘consult with the people’. That never works. Unless the people agree with the original proposals. In which case, democracy seems to work.